In keeping with the increased sophistication and functionality associated with the so-called, “digital revolution”, the digital picture, or photo, frame is the natural successor to the traditional picture frame. A digital picture frame allows you to transfer digital photographs directly from your digital camera, without any requirement for a computer, to the frame, where they are stored, and can be displayed on a bright, colour rich, LCD (“Liquid Crystal Display”) screen. The size of the screen on which a digital photograph is displayed is obviously important, and should be matched to the quality of the photographs that your digital camera is capable of producing and the distance at which these are likely to be viewed, when placed in the frame. As – if not more – important, however, is the “resolution” of the frame, that is the total number of picture elements, or “pixels” (often quoted in the form of rows x columns) of which the displayed image is composed. A resolution of 640 x 480 pixels, for example, is adequate for a traditional, 6 x 4 inch print. 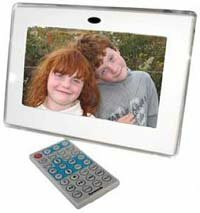 The Dynamode Digi-FR7 Digital Photo Frame, for example, is a 7 inch model, with a resolution of 480 x 234 pixels. Digital photo frames are available in a wide range of sizes – from a few inches, measured diagonally, up to perhaps 20 inches, or more – and, indeed, in a wide range of styles and finishes, from plain plastic, to rich wood, in light and dark hues; many frames are equipped with interchangeable facia, so that you can change the look of the frame to suit your décor. Some digital photo frames have a small amount of internal storage – perhaps 32 MB – but are more commonly equipped with a slot for a memory expansion card. Frames are available with compatibility for all the common memory card types – CF (“Compact Flash”), SD (“Secure Digital”), etc.. – and some have multiple memory card readers. It is, however, worth making sure that your chosen frame is compatible with the memory card in your digital camera, either directly, or via an adaptor. 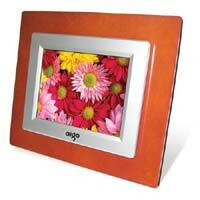 The Aigo A2160 Digital Photo Frame, for example, features 32 MB of internal memory, plus compatibility with CF, SD, Memory Stick and MMC cards. Digital Photo Frames allow you to share your digital photographs with your loved ones, or just display them for your own enjoyment, with no need for a computer, or an expensive printer and photographic paper. Transferring photographs to a frame is easy, directly from your digital camera, and you can choose to display a single image, or a multiple image slide show, complete with sound, and slick transitional effects. You can also change the image, or images displayed, to suit your mood, or audience, and a remote control unit allows you full control of the frame, even if it is hung somewhere inaccessible.